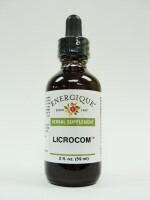 Licrocom: is a fortifier for the adrenal glands. Licrocom contains organic licorice (root), bayberry (root bark), organic Gotu kola (aerial parts), bee pollen, Irish moss (whole plant), cayenne (fruit) and distilled water. 25% ethanol.